$12 Admission. Children 12 and Under Admitted Free. One ticket is good for the entire weekend! The largest indoor motorcycle and powersports show in Kentucky! 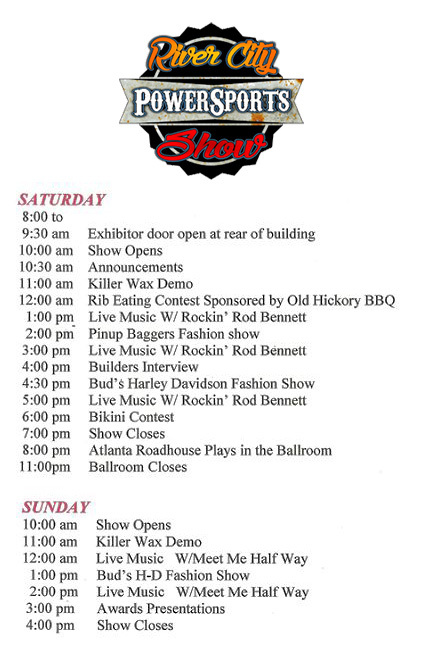 Bike Show, Vendors, Fashion Shows, Miss Power Sports Contest, and more! All forms of powersports will be showcased – ATV, UTV, Campers and Motorcycles! Also hosting the American Bagger Magazine Baddest Bagger in Kentucky show as part of the River City PowerSports Show! This will feature 50 to 100 of the Top Big Front Wheel motorcycles in the USA!